Dress your food in the flavors of the season for enduring energy. Fall into healthy eating with this simple, seasonal vinaigrette for steamed green vegetables, salads and hearty whole grains. Whisk oil, vinegar, Dijon and maple syrup. Season with salt, pepper and turmeric, and whisk all ingredients together. With a ball jar, simply toss all ingredients into the jar. Screw on lid and shake! It's Day 12 of the #30DaysofGreen challenge sponsored by Plant Pure Communities. I'm loving discovering new ways to addnutrient dense greens to meals, especially in the early morning. Today I took massive lettuce leaves called Tropicana Green Leaf from Gotham Greens in New York - a favorite, and spread them lightly with Artisan Foods raw cashew buttah (my superfood muse), along with a topping of raw cashews, chia and hemp seeds from Navitas Organics. You can fold the leaves into pockets or roll them, and then crunch away. I love'em in the morning. My clients report its a supersnack!! Ever make a sandwich or lunch wrap using lettuce rather than bread? It offers the light flexible energy of a salad to power through your day. You can use a variety of leafy options such as Boston, Green Leaf and Butter lettuces. I prefer Romaine for wrapping because it’s sturdy and crisp. Also, the life force which is evident in the root system of the romaine leaves is noteworthy. Method: Lay two large leaves out in a criss-cross fashion. Place the burger in the center of the leaves where they intersect. 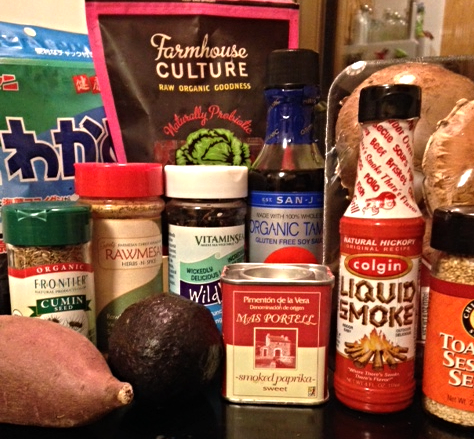 Top the burger with a nutrient-dense spread like @followyourheart vegan mayonnaise (chipotle please! ), hummus or a favorite vegetable pate, and top with grilled vegetables. Fold the lettuce leaves over the stack to create a pocket-sized sandwich that’s perfect for healthy eating on-the-run. Food as fuel is a powerful image. Do we eat with our eyes, or do our food choices reflect greater consideration of how food is ultimately going to make us feel and serve us. The longer I eat with nutrient density top of mind rather than merely counting calories or MACRONUTRIENTS, carbohydrates, protein and fat, the more I reject the idea of eating food that is not going to allow me to function at the highest level, either now or later. Gone are the days of feeling deprived eating healthy. Today, the delicious possibilities of either home-cooked food or food that is prepared by caring, conscious folks invested in the collective well-being of others offers overwhelming hope for what is possible in the future. You do not have to be sick and tired. You can be unstoppable. Sometimes you whip up a batch of something and it just exceeds expectation. These clean energy bites are raw, vegan, gluten-free, soy-free, refined sugar-free, dairy-free and DELICIOUS!!! Place all ingredients into a bowl and mix with wooden spoon or spatula, slowly incorporating the ingredients. If the batter is too dry, add a drop more honey or nut butter. If batter is too wet, add more protein powder. Today, I used these exact measures and they came out perfect. Once all of the ingredients are incorporated (don't over-mix batter! ), and batter is just moist enough to form a ball, roll out balls of batter onto a plate using up the whole mixture. I freeze mine, and take them out as needed, rather than keep them in fridge where they might dry out. It depends how fast you eat them and how many others will be grabbing up these plant-powered treats! Bet they would be good half-dipped in melted chocolate chips and rolled in toasted pecans. I loved them just as is today. These are the perfect pick-me-up at the office, before or after the gym and for a fast breakfast get-away in the morning. Legendary American novelist Ernest Hemingway made "for whom the bell tolls" famous when he used the quote as the title of a book that is set during the Spanish Civil War. This much contemplated phrase in the context of eating well, conjures up the ringing of the school lunch bell; a loud sound inspiring glee and class dismissal. Presently, when the clocks strikes midday, there is a universal understanding that it’s about time, give or take an hour, to stop working in order to have a meal. Whether most immediately heed the call is another story. The distinct sound of the proverbial lunch bell in has become harder to hear as deadlines and obligations peak. With action-packed schedules, it has become easy to delay mealtime or even worse, to allow tasks to eat up our time instead of sitting down at the lunch table to nourish and recharge mind and body. Unfortunately, to keep productivity high, some people favor putting their midday meal on hold. Only bathroom breaks remain a high priority. Sadly, getting stuff done has become more important than supporting the body that generates the power to make things happen. Being too busy for a well conceived meal is highly overrated. Eating a proper lunch can be the key to supporting a productivity-filled afternoon fueled by energy that will not wane. – World Health Organization (WHO). A secret weapon to ensuring the body is fueled on high octane instead of running on breakfast fumes is to ‘brown bag’ it – take a packed meal from home. Utilize your lunch break to be healthy and to recharge. Toting your lunch gives you more control over food choices, and it doesn’t take much time or creativity to plan ahead. Your homemade lunch will likely be cheaper and provide more bang for your nutrient buck than what you might purchase. Don’t forget about leftovers. Re-purposing those delicious bits and pieces from dinner last night can provide real comfort food in the middle of a time-strapped day. If you are the designated cook at home, think about how you might incorporate leftovers into tomorrow's lunch. As you prepare to store leftover food at night, consider packing it into travel containers before it reaches the fridge. Why it matters to avoid plastic bags and containers and instead replace them with smart, sustainable solutions. Every day, 20 million plastic sandwich bags (almost 7.5 billion per year) and countless other single-use plastic items (containing chemicals that can be absorbed by our bodies) are dumped into oceans and landfills. Wraps are an easy and quick healthy out-the-door meal. Tightly rolls up the wrap, folding in the left and right sides like a burrito. Wrap the toll in wax paper or foil. Slip into your lunch box or knapsack. Lunch Tip: Eat lunch within 4 hours of breakfast, particularly if you don’t snack in between. Food choices are a major influence on productivity level during the day. Give in to the idea that at lunch and every meal, we get to choose how we are going feel and perform based on the vital food choices set before us. A healthy lunch in the middle of an insane day could make you unstoppable. Ring that bell! I loved discovering grain-free granola. Eating granola without grains in the ingredient list is my preference now. I feel lighter after eating it, and it offers me considerably more staying power (sustained energy) until my next meal. When feeling adventurous, I like to make my own granola with minimal ingredients including unrefined coconut oil. This granola is delicious over fresh berries and yogurt. Directions: 1. Preheat oven to 180°F. 2. Chop Brazil nuts and pecans in a food processor. 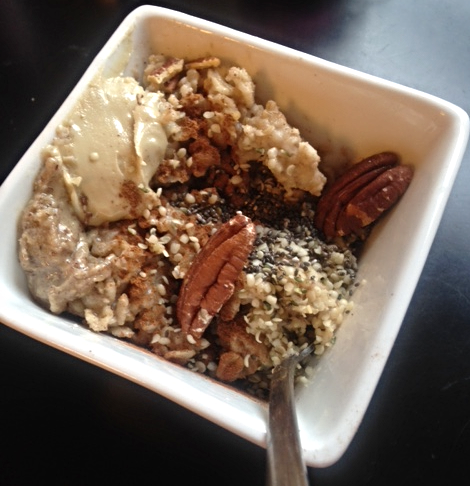 Mix in a bowl with all the other nuts, seeds, and coconut flakes. 3. Combine melted coconut oil, maple syrup, vanilla extract, and cinnamon. Pour into the dry ingredients and mix until everything is well-coated. 4. Place in the oven to cook for 30 minutes. And if you don't feel like preparing Grain-free granola at home , my current favorite grain-less granola on store shelves from Paleonola tastes it like it came from your oven! Who can resist a healthy breakfast that resembles a soft-serve bowl of ice cream? I add Paleonola religiously to my morning bowls with dairy-free yogurt and frozen/fresh/dried fruit depending upon the season. Plant perfect. Calorie counting is a vicious cycle. Restrict calorie intake too much and your body thinks it's being starved. The stress hormone cortisol comes out to play interference. It can sabotage the best intended weight loss efforts. It can support fat storage, suppress the immune system, and cause an energy deficit (fatigue). Cravings kick in. Metabolism stalls and you get hungrier. Eating delicious plant-pure food won't trigger cravings. It will support sustained weight loss, a balanced mood, higher energy levels (without peaks and valleys) and an intense motivation to repeat. Bonus: We know now that lifestyle change, namely eating a plant-based diet, can prevent 80% of chronic lifestyle diseases such as heart disease, type 2 diabetes, cardiovascular disease, cancer etc. Sometimes it’s just easier to order in when time is short and there are mouths to feed. Takeout from a neighborhood Chinese restaurant seems like a safe bet health-wise, especially when ordering off the section of the menu now catering to the calorie-conscious. The fine print indicates that select dishes can be steamed instead of sautéed, with the sauce delivered on the side if you desire. So, what about that secret sauce? Typically loaded with processed oil, refined sugar and added salt, the sauce packs a knockout punch calorically. The cost to your health (not to mention your wallet) is reason to try this one at home – the fakeout take out. Have a look in your green grocer’s freezer. Pre-cooked multi-grain medleys have arrived to kick-start a snappy stir-fry you can have on your table in minutes. Trader Joe’s Multi-Grain Blend with Vegetables is a savory combination of barley, spelt and whole grain rice paired with peas, corn, carrots and zucchini. And new to Whole Foods Market are the Engine 2 PlantstrongTM Grain Medleys, my favorite of which is the Morning Blend, a chewy mix of wheat berries, farro, black barley and golden raisins which cooks up fast at lunch and dinner too. These whole grain blends really don’t require a recipe. You can cook them in a wok, sauté or fry pan, according to the instructions, and add your own (cooked and raw) mix-ins or toppings. Raw vegetables: cucumber, bell pepper, shredded carrots or sprouts. I like to toss the hot grain dish over raw spinach. It relaxes the greens quickly and the nutrient profile remains intact. Flavored balsamic vinegars or a simple Asian-style sauce made with equal parts low sodium tamari, maple syrup and sesame seeds. A little goes a long way. With a tiny bit of creativity in the kitchen, eating healthy and deliciously in no time can be habit forming. Mom's Vegetarian Mock Chopped Liver comes out perfectly with frozen vegetables, so whether greens beans and peas are in season or not, this plant-strong recipe can be part of your healthy eating arsenal! A group of health-seekers in Scarsdale, NY joined me yesterday at the Scarsdale Public Library for a special screening of the film Forks Over Knives, the thought-provoking film that examines the notion that lifestyle diseases such as heart disease, diabetes, hypertension, cancer and others can be controlled and often reversed eating a diet which eliminates animal-based foods and highly processed, often packaged foods. I hopped on board to share the power of plant-powered eating this film espouses and promised guests I would post recipes for the wildly popular Vegetarian Pate served as refreshment there. Hoping this recipes inspires more cooking, baking and eating the plant-powered way, as it does me, whenever I prepare it. Keep in mind that in this film, all oils are removed from the diet to promote optimal health. In the case of olive oil, one could say that you are better off eating the whole olive than the processed oil extracted from the olive. My goal in sharing this recipe is to show that even simply reducing the amount of oil we eat daily, and experimenting with new recipes which feature less oil or no oil, is a step in the right direction. Some people will dive head first into the no-oil preparations suggestions while others will need to take baby steps to consider oil-free an option. My Vegetable Pate recipe can be adapted to both styles of healthy eating. For the #30DaysofGreen challenge on www.PlantPureCommunities.com in the month of April (2017), the goal is to go oil-free, so this recipe complies with whole food, no-oil parameters. For no-oil version, start by heating a cast-iron or ceramic pan. I love the Italian Moneta pan for water sautéing. Add chopped raw onions to a searing hot pan without any preliminary coating of the pan with oil. Keep the onions in motion by moving the pan. I prefer this over stirring the onions for best results. When the onions are transparent, toss them with a splash or two of vegetable stock, coconut water, juice or plain ol' water, and allow the onions to just absorb the liquid. Keep shaking the pan periodically. Turn off the heat and allow sautéed onions to settle. Combine ingredients: green beans, peas, almonds, walnuts, bouillion and onions in food processor. Process and chill. This vegetable pate is delicious served with healthy tortilla chip options. For impromptu entertaining, cut-up fresh seasonal raw veggies with this simple, fast food recipe. Spooned over a salad, instead of dressing, or placed atop a veggie burgers are alternative ways to spoil guests and yourself. Great-tasting food with whole food, plant-based, no oil benefits is a win-win. Multiple times a day, we have an opportunity to influence our physical and emotional health eating food with the most bang for your nutrient buck. Visit my Pinterest page and POWER GREENS board at http://pinterest.com/ronnacorlin/ for more greens recipe ideas. The traditional medical system doesn't give us the power that eating more whole foods, especially greens, dishes out. Eat more plants and prosper!! Saying goodbye to summertime and all of its' sweet offerings is never easy. Labor day is near and back-to-school preparations are in full swing. Outdoor pools promise to close in a few days, while piles of freshly picked corn are shrinking fast. Towers of boxed summer blueberries at irresistible prices are no more. I'm so glad I loaded up my shopping cart with an absurd number of boxes of organic blueberries at Trader Joes in late July. I can hardly close my freezer door, but my mornings are merrier when this seasonal favorite shows up in my oatmeal bowl, on salads and in the blender when a craving for 'nice' cream hits. Good to see whole watermelons are still available in the produce aisle. I realize that pre-cut watermelon to-go has become an almost year round commodity in markets. However it just can't compare to selecting a melon, smelling it, knocking on it to check for ripeness and lowering that baby into my shopping cart. I love to blend fresh watermelon in a high performance blender and pour it into a glass with some fresh basil. Cutting it up with a squeeze of lime and a sprinkle of lime zest is most refreshing. Sometimes a special recipe comes along that captures a season in one bite. That is surely the case with this sweet, tangy Watermelon Salsa. Served with tortilla chips, over a salad, a main dish or just as a side dish, this flavor of cool summer days is worth preserving as long as supplies last! Combine watermelon, cucumber, onion, jalapeno, herbs and lime juice in a bowl. Add salt. Chill well before serving. So often, when I hear or read the words mindful eating, I am somehow repelled by it. Odd for a health coach right? I think the subject is very important, in terms of preventing its’ polar opposite -- mindless eating; eating unconsciously and somewhere in the past or future. Perhaps it’s because in younger years I was a mindless stress eater. I wouldn’t typically check out when I ate nutritious foods but once around the sugary treats I was swept away and lost track of the moment. I know there have been times when I have been checked out while multi-tasking, busy on the computer or immersed in busyness on a digital device. Back in grade school, I vividly recall that I would park myself outside the kitchen freezer door armed with a quart of Oreo® ice cream and a spoon. I realize now that I was living on auto-pilot in those moments. Nobody was consciously at the wheel. To this day, when I read about eating mindfully in books and articles online, the subject tugs at those lucid memories. As a nutrition educator, these years later, I approach the subject of conscious eating with renewed interest given new tools. This concept of being present to what and how we eat first came to me when I started eating with nutrient density top of mind. I got off meat and poultry and most dairy products, quit refined sugar and caffeine and reduced my gluten intake. at the same time I significantly ramped up my intake of vegetables – especially micronutrient-rich dark leafy greens. In the process, intense cravings faded, my taste buds were reborn and I became so excited by the delicious food I was preparing and eating and how it made me feel that I grew passionately committed to creating a sacred space at mealtime and being infinitely present in it. The idea that I would no longer have to diet, count calories, feel deprived, overthink protein and chase my blood sugar with a snack every few hours freed me to stay present more. I would eat mindfully now without thinking about it. I wonder in this writing if this is a contradiction in terms! Not really. Eating real, whole, plant-based food has actually slowed me down. It grounds me in the now. This book HOW TO EAT inspires my path. It’s a neat little read filled with big ideas. Zen teacher Thich Nhat Hanh illuminates on the mindful practice of selecting the food we eat, peaceful meal prep, zen cooking strategies, the nourishing art of eating, mindful mealtime conversation and dishwashing as meditation. The actual act of mindful eating makes a lot of sense to me in terms of the importance of being conscious and present when we eat. It clearly feels a lot better and tastes a lot better to be fully in the moment when eating. I just have a hard time listening to all the mindfulness eating jargon out there today. All the rules of eating mindfully, while valid are still rules. I don't eat according to rules anymore. I like the idea of eating like a yogi - seeped in ideas of slowing down when we eat, making a ritual of healthy cooking with real ingredients and being nourished by food mind, body and spirit. Food is afterall fuel, and the state in which we find ourselves at mealtime inevitably lays a foundation for the rest of our day (and into tomorrow.) Often too busy to eat lunch, we might wind up gobbling down an energy bar in haste chased shortly after by a cup of coffee. This can lead to an afternoon and evening that’s far different by design than one that runs on brown-bagged leftovers from last night’s Ginger Vegetable Stir-fry and simply brewed unsweetened iced tea. Energy and stress levels, mood and the way we move in the world is directly influenced by the grade of fuel we choose to put in our tank. I recently attended a local workshop called How to Eat Like a Modern Yogi given by Maria Savarino, a Certified Yoga Instructor. Maria shared the importance of proper diet for mind, body and spirit. A yogi with some sharp plant-based cooking skills in the kitchen, Maria talked about balancing yogic values and nutritional needs. She emphasized how the foods which nourish our body are instrumental in creating our thoughts and emotions too. My favorite illustration of yogic eating was the preparation of Maria’s Acorn Squash Chocolate Karma Cake. Just the name makes me want to preheat my oven! This moist, nutrient-rich recipe combines healthy grains, seeds, spices, nuts in the form of milk and a nut meal, seasonal vegetables, alternative flour and other whole ingredients. Acorn Squash Chocolate Karma Cake: A very moist and healthy cake. Oven 350 Degrees 35 – 45 Minutes: check with a toothpick at center: if no ingredients are left on toothpick, cake is done. Add all the ingredients to an oil lined deep dish baking pan: ceramic or metal. Depending on your pan, you may wish to line the pan with baking paper, cut to size, on top of the oil lined pan, and then it is easier flip the cake once cooled. Maria’s business is Yoga Touch in Westchester County in New York. Here’s to eating with a present mind so you can savor every flavor and be fully nourished daily. Namaste. The Best Part of Waking Up - Scoot Over Folgers! I woke up this morning and decided to alter my standard wake-up routine. Typically, guilty of reaching for my Smartphone within arm's reach of my bed, I will check breaking overnight news and social media before my bare feet hit the floor. I will grab the television remote to switch on my morning news program while heading to the front door to pick up the daily paper waiting outside. As soon as I rise, and before filling my belly, I’ll stuff my head with noise and begin a long march of multi-tasking all day long. Today, I decided, was going to be different. Could I spend the first fifteen minutes of my day differently, I wondered, and throw opposing intentions into the universe to recalibrate my day? What could I do to get grounded and energize myself before my morning herbal Joe? This in mind, I glanced at the clock sitting on my night table and committed to ease into this day - at least the first fifteen minutes of it, more mindfully. It was in that spirit that I began to slow things down. After sipping the glass of water sitting on my nightstand, I had a moment of gratitude for my ability to break with routine. Then, instead of my cell phone, I reached for a bottle at the edge of my headboard - a bottle of Tangerine essential oil. As the scent of citrus, especially upon rising, is widely known to be invigorating, I inhaled the open bottle like my life depended on it. I noticed the bottle said the word 'Cheering' on it – indeed. Next, I slid into a pair of specially constructed slippers hiding in the back of my closet that slid between my tired toes. They made my sleepy feet so happy. Then, while sitting on the edge of my bed with my feet firmly planted in the moment, I made a conscious decision to limit my thoughts strictly to my present activities. No list making, no worrying about imperatives of the day - just being for the duration of this alternative rise & shine. I took a few moments to stare out of my bedroom window. This luxury is usually reserved for weekends. Staring into the trees, duck pond and golf course beyond my window, it all seemed routine. But as I allowed a couple peaceful moments to pass to really take in what was in front of me, I noticed that the tree right before my eyes was bursting with beautiful red buds. I had not noticed that this weekend and had looked out this window more than once. In the stillness of this experiment I had already sharpened my view. Other activities this morning included ringing a favorite set of chimes. The sound was so pure and enlightening. I placed a heaping spoonful of extra virgin coconut oil in my mouth to get in some oil pulling, refreshed my face with a Rosewater mist and my lips with a calming lip balm boasting eight organic oils. Up next was dry brushing. Off to the kitchen I went to heat some filtered water and add the juice of 1/2 of a freshly-squeezed lemon to get the digestive juices flowing. Before I knew it time was up. I felt unhurried, calm, refreshed, invigorated and ready to take on the day. What this made me realize is that we can either create our own chaos when we awaken or we can opt to stop, smell the flowers and build an arsenal of good vibrations to jumpstart the day. Those first minutes of activity or inactivity are crucial. Turns out I didn't miss a thing on my phone that wouldn't be there after taking time to recharge my personal battery. Quiet time really is the best part of waking up. The world meets us very differently in that stillness. And if we are lucky, it seeps into our day.